One major difference is gauges vs. counters. In Dropwizard Metrics counters can go up and down whereas in Micrometer counter must increase monotonically. I thought it's a bug... Counter is used in simple scenarios like counting how many requests succeeded. So how can we measure things like the number of concurrent requests or queue length? With gauges, but it's slightly convoluted. Did you notice how Metrics.gauge() takes a new LongAdder() as an argument? And returns it? This way we create a gauge that track (by periodically polling for value) any instance of Number class (e.g. AtomicLong or LongAdder). We can modify the returned LongAdder and its current value will be reflected by the gauge. Neat! Moreover, there are helper methods like gaugeCollectionSize() and gaugeMapSize() that take any Collection or Map respectively - and are quite self-explanatory. JvmGcMetrics - GC promotion rate, etc. 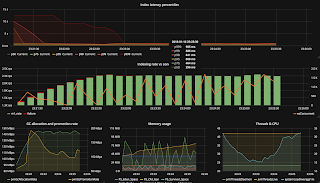 The dashboard definition for Grafana is available on GitHub. 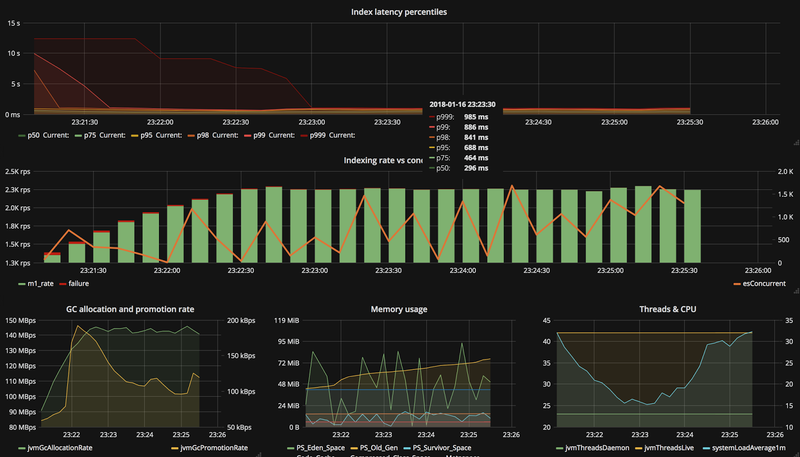 Notice how this application uses about 100 MiB of RAM while sustaining almost two thousand concurrent connections (!) Also less than 45 live threads compared to thousands of concurrent connections is impressive. In the last part of this short series, we will wrap everything together in a Spring Web Flux application. Thank you some much tomasz. One can only acknowledge your deep understanding when you decide to share a topic. This series really is helpful to migrate to micrometer.